This was another album sent to me to review. I was struck by the artwork when I opened up the package, particularly the prevalent use of primary red. It's very eye catching. The quality of the packaging is quite nice too. Thick cardstock, hefty opaque vinyl and nicely done insert. You can tell a lot of thought and effort went into it. As far as the sounds contained in this package, it's more of a mixed bag. Things start out with "Smooth Escalator." Over a very "Billie Jean"-esque bassline, this little funk outbreak plays like a joke that I'm not in on. Maybe as an album closer it could have worked but it seems odd to lead off the album with a song that sounds so unlike the rest of the album that follows. Once you've cleared that hurdle, the bulk of the album plays like a pretty interesting punk/garage guitar showcase. The songs are tight, snappy and don't overstay their welcome. Vocally Ned Garthe Explosion remind me a bit of Needles//Pins especially when the choruses kick in. I can't go so far as to say I really dig this, but it's totally fine rock and roll. 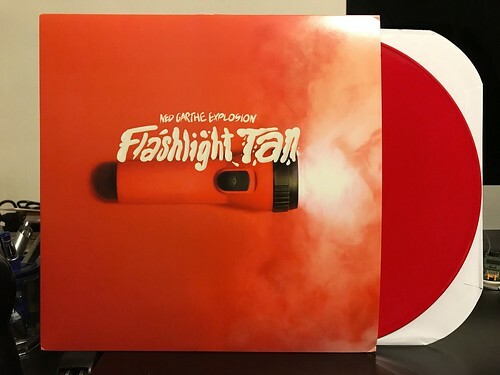 Aside from the first track and the song "Flashlight Tan" that closes out the album, it's a pretty good listen. The two bookends strike me as a weird way to start and end and record full of crunchy guitar rock, but the middle bit is perfectly serviceable.